Thanks for your kind comments and messages to my Parrot bag :) I appreciate it so much! Vielen Dank für Eure lieben Kommentare und Mails zu meiner Papageientasche :) Ich habe mich darüber sehr gefreut! I'm a big fan of black and white photography with selective colouring. I have a few examples in my second Etsy shop, Duni Studio Design. So today I'm showcasing this type of work from other artisans on Etsy. Enjoy! I'm bin großer Fan von Schwarz-Weiß-Fotos mit selektiver Kolorierung. Einige Beispiele gibt es in meinem zweiten Etsy Shop, Duni Studio Design. Heute zeige ich eine Auswahl solcher Fotografien, die ich bei Etsy gefunden habe. Ich hoffe sie gefallen! das sind wunderschöne SW-Photos! Genial! Jedes einzelne find ich super gut gelungen! We have a big print similar to the one with the cab at work :-) Have a great week Duni! Die Fotos sind total schön! Mir gefällt der Kontrast auch sehr gut. I love this style of photography as well. I love the classic look of black and white photography and the pop of color adds just the right touch. I really like the one with the book and glasses--it gets the balance just right! Deine Collage ist so schön, Duni! Ich wusste nicht, dass Du auf Etsy auch colorierte Schwarz-Weiiß-Fotos verkaufst. Wie toll! Dieses, auf Etsy gefundene, mit den Büchern und der Brille ist mein Favorit. Du hast Dir bei Deinen Beschreibungen Deines "DIY Frida Kahlo Kostüms" so viel Mühe gegeben. Es muss wahnsinnig aufwendig gewesen sein, alles so festzuhalten. Unglaublich, wie genau Du alles gezeigt hast. 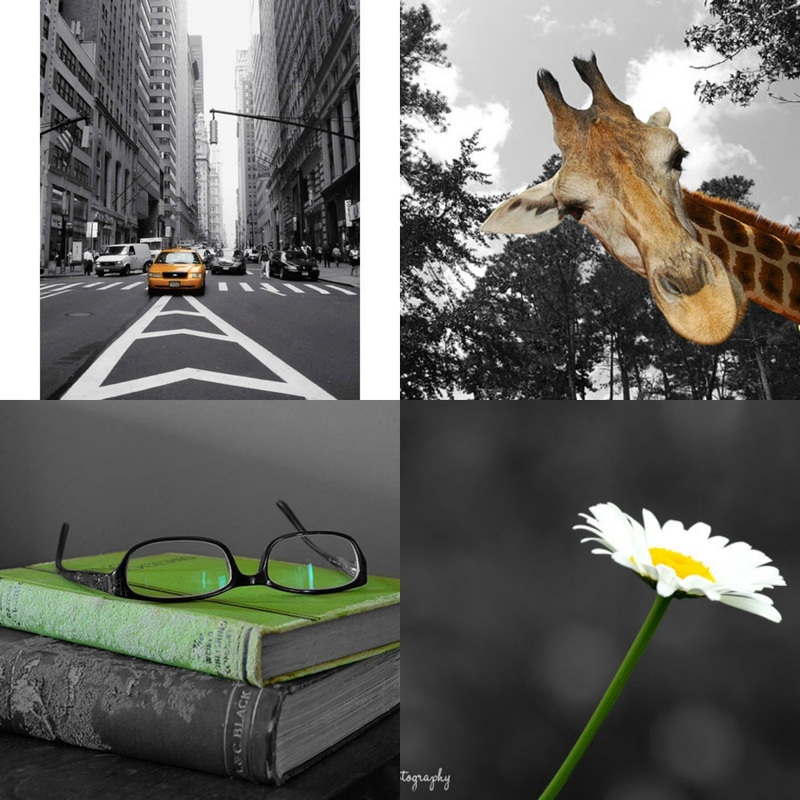 The giraffe is too funny, but I think the book and glasses picture is my favorite. Great mood board! I love that type of photography as well, the photo of the book is great but the Daisy is my favorite. I love daisy's! Have a nice week dear Duni !!! I love this photography too and the giraffe makes me smile! Another great moodboard, Duni! Great photos! Love these! Love your parrot bag too! Ahh....green! I miss the color green! I was scrolling down and the giraffe made me giggle. It's like he's just popping over to say hello.